The U.S. Postal Service lost $2 billion in the third quarter of fiscal 2014, which ended June 30, though mail revenues actually grew $424 million over the same period last year. First-class and standard mail volume continued to decline, but an emergency rate increase implemented in January -- as well as the sustained boost in package business -- helped to offset the losses. USPS took in $16.5 billion between April 1 and June 30, a 2 percent increase from the third quarter of fiscal 2013. The Postal Service actually turned a profit on its controllable costs. But beyond its control are expenses associated with workers’ compensation and prefunding requirements for retiree health benefits. 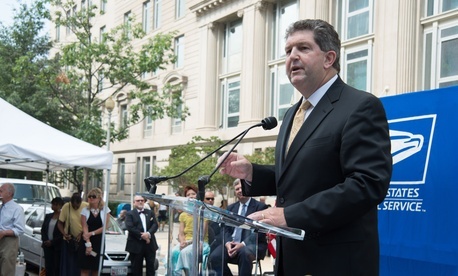 Postmaster General Patrick Donahoe, who reiterated his call for comprehensive postal reform from Congress, said innovation has helped position the agency for declining mail volume. “We’ve been effective in developing and marketing our products, and we’re improving how we leverage data and technology -- all providing a higher return on mail for many customers and causing them to take a fresh look at the Postal Service,” Donahoe said. Package revenue increased 6.6 percent over the third quarter of fiscal 2013. The Postal Service has brought in $51.2 billion so far in fiscal 2014, a more than $1 billion increase over the first nine months of last year. Still, the agency remains hamstrung by a congressional mandate to prefund health care benefits for its current and future retirees. Postal management has repeatedly asked Congress to reorient the payment schedule for that prefunding, which differing pieces of legislation passed by both Senate and House committees would do. Corbett said the Postal Service will once again miss its scheduled $5.7 billion prefunding payment owed to the U.S. Treasury in September. Postal unions said the recent financial news paints a positive picture for USPS, and calls to further cut postal services are irresponsible.